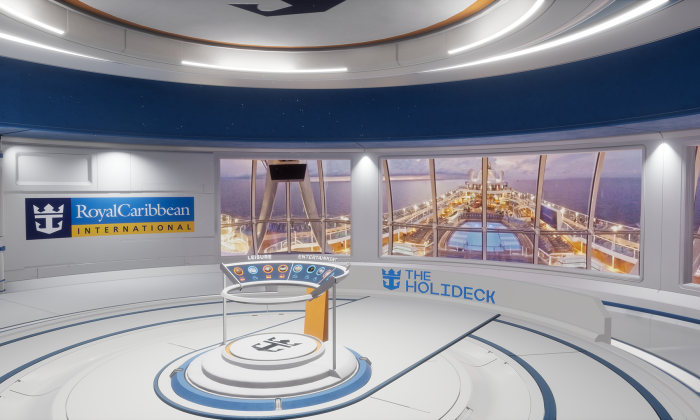 Royal Caribbean International has launched a new virtual reality (VR) experience, the HoliDeck, as part of its new marketing campaign, “Where Everyone Gets What They Need”, to celebrate its 10th anniversary. The islandwide campaign, which will run for a year, was conceptualised and executed by iris Singapore and Mindshare. iris Singapore was also responsible for producing the HoliDeck. The new VR experience allows those on board to experience a selection of 11 activities such as skydiving, surfing and rock climbing without leaving the cruise ship. The HoliDeck will be showcased at the upcoming NATAS Travel Fair in August, and the company is also distributing cardboard VR headsets to its key agents in Singapore, as well as international representatives in the region as the latest sales toolkit. In addition to the HoliDeck, the campaign will also be executed via print, out-of-home (OOH), online and TV. Its latest TV commercial revolves around the idea that Royal Caribbean is an enjoyable and hassle-free holiday that appeals to multi-generational families, couples and singles. The line “You can’t always get what you want” from the Rolling Stones classic hit is “playfully quashed” by the one-size-fits-all Royal Caribbean holiday showcased in the TVC. “A Royal Caribbean cruise is the holiday for guests all of ages. No matter what kind of adventures they seek, there are so many things to do onboard, be it sports, parties, shows and dining, so there is something for everyone,” Nicole Lai, marketing manager, Royal Caribbean, said. “We are always ready to embrace innovative technology to connect with digital savvy consumers. We hope through utilising the VR technology and game design, consumers will change their mindset and to give cruise holiday a try,” Lai added. According to Dean Reinhard, creative technology director (APAC), iris Worldwide, the team created real-time interactive CGI scenes in order to bring the experience to life. Live action scenes were captured using a range of high-end 360 cameras, equipped with “binaural” audio microphones to further enhance to overall presentation of the HoliDeck. A HTC Vive headset and controllers are used to track users’ movements within the scene, allowing for interaction with scene elements. “This makes the branded content more immersive and interactive, and provide an exciting experience that continues to resonate with users long after they have returned to reality,” Reinhard said. A healthy dose of rivalry never hurts anyone, and when it comes to Pepsi and Coke, it gets all the attention brands ever want. Enj..
DiGi is set to compensate an old man for the damage to his car following a road rage incident. Is this part of a marketing campaig..
Singapore Airlines and Grab tie-up: A coup for the ride hailing app? "It will be a tricky balance between immediate reward and keeping people engaged long enough.".. Bangkok, Tokyo and Taipei are the top three most popular destinations for Asia-Pacific travellers over the Lunar New Year period i..